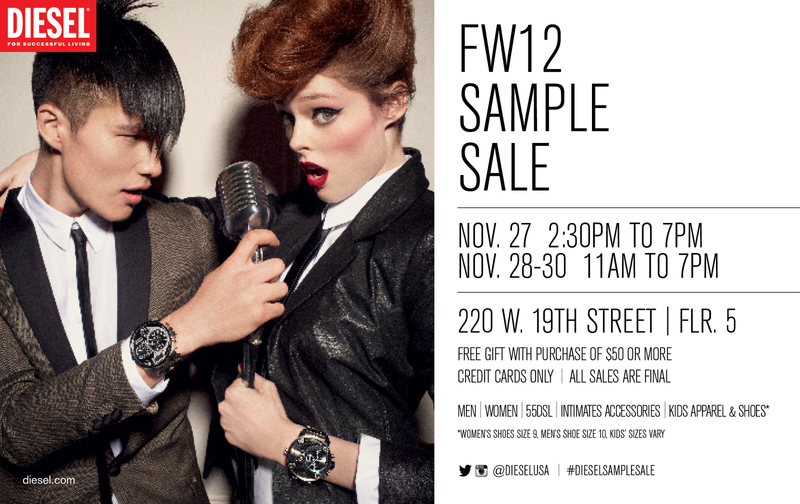 Just in time for the holidays, it's the Diesel Sample SALE! This is the perfect time to get the ones you love (or just yourself) some super haute clothes from one of my fave brands! Check out the deets below. Deets to Know: Free gift with purchase of $50 or more * CREDIT CARDS ONLY * All sales are FINAL (don't go trying to return stuff okrr)! What's For Sale: Clothes for men, women, kids as well as clothes from the 55DSL line, infant accessories (for the baller baby in your life) and kids apparel & shoes. Note: Women's shoes size 9, men's shoes size 10 and kids shoes size vary. Have a blast and don't forget to pick me up something fierce for the holidays!